Walt Disney was born in Chicago, Illinois to Elias Disney and Flora Call. He was named after his father’s close friend Walter Parr, the minister at St. Paul Congregational Church. In 1906, his family moved to a farm near Marceline, Missouri. The family sold the farm in 1909 and lived in a rented house until 1910 when they moved to Kansas City. Disney was nine years old at the time. According to the Kansas City Public School District records, Disney began attending the Benton Grammar School in 1911, and graduated on June 8, 1917. During this time, Disney also enrolled in classes at the Chicago Art Institute. He left school at the age of sixteen and became a volunteer ambulance driver in World War I after he changed his birth certificate to show his year of birth as 1900 in order to be able to enlist in the service. He served as a member of the American Red Cross Ambulance Force in France until 1919. Disney returned to the USA, moved to Kansas City and, with Ub Iwerks, formed a company called “Iwerks-Disney Commercial Artists” in January 1920. The company faltered and Disney and Iwerks soon gained employment at the Kansas City Film Ad Corporation, working on primitive animated advertisements for local movie houses. In 1922, Disney started Laugh-O-Grams, Inc., which produced short cartoons based on popular fairy tales and children’s stories. Among his employees were Iwerks, Hugh Harman, Rudolph Ising, Carmen Maxwell, and Friz Freleng. The shorts were popular in the local Kansas City area, but their costs exceeded their returns. After creating one last short, the live-action/animation Alice’s Wonderland, the studio declared bankruptcy in July 1923. Disney’s brother Roy invited him to move to Hollywood, California, and Disney earned enough money for a one-way train ticket to California, leaving his staff behind, but taking the finished reel of Alice’s Wonderland with him. Disney set up shop with his brother Roy, started the Disney Brothers Studio in their Uncle Robert’s garage, and got a distribution deal with New York City states-rights distributors Margaret Winkler and her fiancé Charles Mintz. Virginia Davis, the live-action star of Alice’s Wonderland, was sequestered from Kansas, as was Ub Iwerks. By 1926, the Disney Brothers Studio had been renamed as the Walt Disney Studio; the name Walt Disney Productions would be adopted in 1928. One of the studio’s employees, Lillian Bounds, became Walt Disney’s wife; they were married on July 13 1925. The Alice Comedies were reasonably successful and featured both Dawn O’Day and Margie Gay as Alice after Virginia Davis’ parents pulled her out of the series because of a pay cut. Lois Hardwick also briefly assumed the role. By the time the series ended in 1927, the focus was more on the animated characters, in particular, a cat named Julius who recalled Felix the Cat, rather than the live-action Alice. Mintz and his brother-in-law George Winkler. When that studio went under after Universal assigned production of the Oswald shorts to an in-house division run by Walter Lantz, Mintz focused his attentions on the studio making the Krazy Kat shorts, which later became Screen Gems, and Harman, Ising, Maxwell, and Freleng marketed an Oswald-like character named Bosko to Leon Schlesinger and Warner Bros., and began work on the first entries in the Looney Tunes series. Christened by Lillian Disney, Mickey Mouse made his film debut in a short called Plane Crazy, which was, like all of Disney’s previous works, a silent film. After failing to find distributor interest in Plane Crazy or its follow-up, The Gallopin’ Gaucho, Disney created a Mickey cartoon with sound called Steamboat Willie. A businessman named Pat Powers provided Disney with both distribution and the Cinephone, a bootlegged sound-synchronization process. Steamboat Willie became a success, and Plane Crazy, The Galloping Gaucho, and all future Mickey cartoons were released with soundtracks. Disney himself provided the vocal effects for the earliest cartoons and performed as the voice of Mickey Mouse until 1947 and replaced by sound effects guy James MacDonald. Joining the Mickey Mouse series in 1929 were a series of musical shorts called Silly Symphonies, which began with The Skeleton Dance. Although both series were successful, the Disney studio was not seeing its rightful share of profits from Pat Powers, and in 1930, Disney signed a new distribution deal with Sony/Columbia Pictures, leaving behind Powers and Ub Iwerks, who had been lured into an exclusive contract with Powers. After heading the only mildly successful Ub Iwerks Studio, Iwerks would return to Disney in 1940 and, in the studio’s research and development department, pioneer a number of film processes and specialized animation technologies. By 1932, Mickey Mouse became the most popular cartoon character on the screen, and many competing studios such as Van Beuren and Screen Gems created Mickey Mouse clones in hopes of cashing in on Disney’s success. After moving from Sony/Columbia to MGM/United Artists in 1932, Walt began producing the Silly Symphonies in the new three-strip Technicolor process, making them the first commercial films presented in a true-color process. The first color Symphony was Flowers and Trees, which won the first Academy Award for Best Short Subject: Cartoons in 1932. The same year, Disney received a special Academy Award for the creation of Mickey Mouse, whose series was moved into color in 1935 and soon launched spin-off series for supporting characters such as Donald Duck, Goofy, and Pluto. As Mickey’s co-creator and producer, Disney was almost as famous as his mouse cartoon character but remained a largely private individual. His greatest hope was to give birth to a child — preferably a son — but he and Lillian tried with no luck. Lillian finally gave birth to a daughter, Diane Marie Disney, on December 18, 1933; and the couple would adopt a second, Sharon Mae Disney, who was born December 21, 1936. Walt loved both of his children. Although his studio produced the two most successful cartoon series in the industry, the returns were still dissatisfying to Disney, and he began plans for a full-length feature in 1934. When the rest of the film industry learned of Disney’s plans to produce an animated feature-length version of Snow White, they dubbed the project “Disney’s Folly” and were certain that the project would destroy the Disney studio. Both Lillian and Roy tried to talk Disney out of the project, but he continued plans for the feature. He employed Chouinard Art Institute professor Don Graham to start a training operation for the studio staff, and used the Silly Symphonies as a platform for experiments in realistic human animation, distinctive character animation, special effects, and the use of specialized processes and apparatus such as the multiplane camera. Walt Disney’s Snow White and the Seven Dwarfs. This film was his first full-length feature production and the first animated film of all time. Pinocchio and Fantasia followed Snow White into movie theaters in 1940, but both were financial disappointments. The inexpensive Dumbo was planned as an income generator, but during production of the new film, most of the animation staff went on strike, permanently straining the relationship between Disney and his artists. Shortly after Dumbo was released in October 1941 and became a successful moneymaker, the United States entered World War II. The U.S. Army took over most of the Disney studio’s facilities and had the staff create training and instructional films for the military, as well as home-front propaganda such as Der Fuehrer’s Face and the feature film Victory Through Air Power in 1943. The military films did not generate income, however, and Bambi underperformed when it was released in April 1942. Disney successfully re-issued Snow White in 1944, establishing the seven-year re-release tradition for Disney features. In 1947, during the dark early years of the Cold War, Walt Disney testified before the House Un-American Activities Committee, and he named several of his employees as Communist sympathizers. Some historians believe that the animosity from the 1941 strike of Disney Studio employees caused him to bear a grudge. His dislike and distrust of labor unions may have also led to his testimony. In 1949, when Disney and his family moved to a new home on large piece of property in the in the Holmby Hills district of Los Angeles, California, with the help of his friends Ward and Betty Kimball, owners of their own backyard railroad, Disney developed the blueprints and immediately set to work creating his own miniature railroad in his backyard. The name of the railroad, Carolwood Pacific Railroad, originated from the address of his home which was located on Carolwood Drive. The railroad’s half-mile long layout included a 46-foot-long trestle, loops, overpasses, gradients, an elevated dirt berm, and a 90-foot tunnel underneath Mrs. Disney’s flower bed. He even named the miniature working steam locomotive built by Roger E. Broggie of the Disney Studios Lilly Belle in his wife’s honor. On a business trip to Chicago in the late 1940s, Disney drew sketches of his ideas for an amusement park where he envisioned his employees spending time with their children. These ideas developed into a concept for a larger enterprise which was to become Disneyland. Disney spent five years of his life developing Disneyland and created a new subsidiary of his company, called WED Enterprises, to carry out the planning and production of the park. A small group of Disney studio employees joined the Disneyland development project as engineers and planners and were dubbed Imagineers. When presenting his plan to the Imagineers, Disney said: “I want Disneyland to be the most amazing place on Earth, and I want a train circling it”. Entertaining his daughters and their friends in his backyard and taking them for rides on his Carolwood Pacific Railroad had inspired Disney to include a railroad in the plans for Disneyland. As Walt Disney Productions began work on Disneyland, it also began expanding its other entertainment operations. 1950‘s Treasure Island became the studio’s first all-live-action feature, and was soon followed by such successes as 20,000 Leagues Under the Sea (in CinemaScope, 1954), The Shaggy Dog (1959), and The Parent Trap (1960). 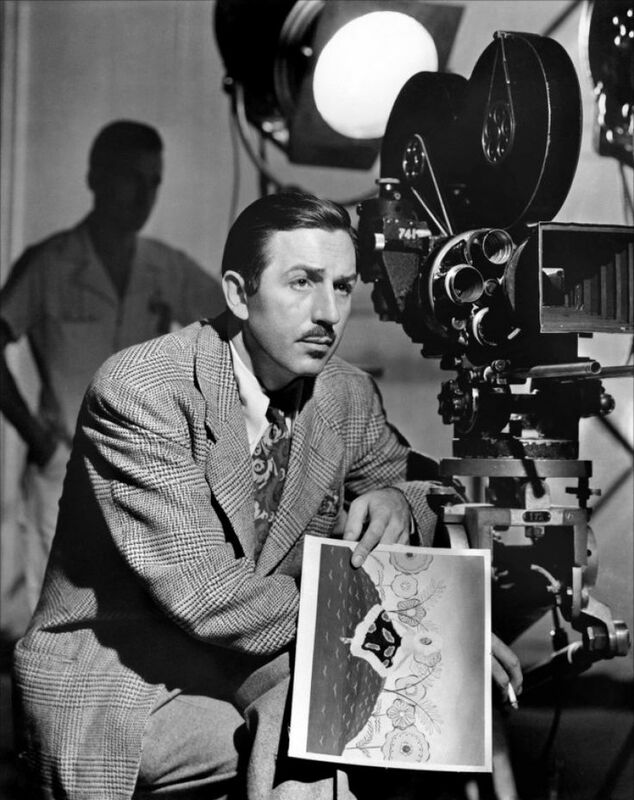 The Walt Disney Studio was one of the first to take full advantage of the then-new medium of television, producing its first TV special, One Hour in Wonderland, in 1950. Walt Disney began hosting a weekly anthology series on ABC named Disneyland after the park, where he showed clips of past Disney productions, gave tours of his studio, and familiarized the public with Disneyland as it was being constructed in Anaheim, California. In 1955, he debuted the studio’s first daily television show, the popular Mickey Mouse Club, which would continue in many various incarnations into the 1990s. As the studio expanded and diversified into other media, Disney devoted less of his attention to the animation department, entrusting most of its operations to his key animators, whom he dubbed the Nine Old Men. During Disney’s lifetime, the animation department created the successful Lady and the Tramp (in CinemaScope, 1955) and One Hundred and One Dalmatians (1961) and the financially disappointing Sleeping Beauty (in Super Technirama 70mm, 1959) and The Sword in the Stone (1963). Production on the short cartoons had kept pace until 1956, when Disney shut down the shorts division. Special shorts projects would continue to be made for the rest of the studio’s duration on an irregular basis. These productions were all distributed by Disney’s new subsidiary Buena Vista Distribution, which had assumed all distribution duties for Disney films from RKO by 1955. Disneyland, one of the world’s first theme parks, finally opened on July 17, 1955, and was immediately successful. Visitors from around the world came to visit Disneyland, which contained attractions based upon a number of successful Disney properties and films. After 1955, the Disneyland TV show became known as Walt Disney Presents, went from black-and-white to color in 1961—changing its name to Walt Disney’s Wonderful World of Color—and eventually evolved into what is today known as The Wonderful World of Disney, which continues to air on ABC as of 2005. During the mid-1950s, Disney produced a number of educational films on the space program in collaboration with NASA rocket designer Wernher von Braun: Man in Space and Man and the Moon in 1955, and Mars and Beyond in 1957. The films attracted the attention of not only the general public but also the Soviet space program. By the early 1960s, the Disney Empire was a major success, and Walt Disney Productions had established itself as the world’s leading producer of family entertainment. After decades of trying, Disney finally procured the rights to P.L. Travers’ books about a magical nanny. Mary Poppins, released in 1964, was the most successful Disney film of the 1960s, and many hailed the live-action/animation combination feature as his greatest achievement. The same year, Disney debuted a number of exhibits at the 1964 New York World’s Fair, including Audio-Animatronic figures, all of which later were integrated into attractions at Disneyland and a new theme park project, to be established on the east coast, which Disney had been planning since Disneyland opened. However, Disney’s involvement in Disney World ended in late 1966, when he was diagnosed with lung cancer in his left lung, after a lifelong habit of chain smoking (where his dreams of advancements in the improvement of human health would have come in handy). He was checked into the St. Joseph’s Hospital across the street from the Disney Studio lot and his health eventually deteriorated. His dedication to his projects was still visible while lying in his death bed. On the evening of December 14, Roy came to visit him. Here, Walt pointed up to the ceiling using the tiles as a grip map. He then signaled Roy about the roads and major places in EPCOT and Disney World. Even sick and near death, Walt’s mind was clear, his imagination fully engaged and his voice enthusiastic. It came as a complete shock to the Disney Family and to the whole world when Walt passed away the next morning. He was pronounced dead at 9:35 AM PST on December 15, 1966 having just celebrated his sixty-fifth birthday two weeks earlier. The official cause of death was “acute circulatory collapse.” His heart simply stopped beating. He was then cremated and his ashes were scattered at Forest Lawn Memorial Park in Glendale, California. It was truly unthinkable. Walt Disney was dead. Roy, who had always been supportive to Walt, looking for and helping him, had lost his reason for living. After an hour or so, Walt’s foot was sticking out from under the blanket. Roy was by the bed, gently rubbing Walt’s foot and said “Well kid, it looks like the end of the road.” Roy was still the older brother to the end. Roy Disney carried out the Florida project, insisting that the name becomes Walt Disney World in honor of his brother. Roy O. Disney died three months after that resort’s opening in 1971.